The team that pitted teams of Sony's robot dogs, Aibo, against each other on the football pitch is moving up the Premier League to develop football-playing robotic Segways. But it is not a project designed to find innovative and fun uses for the strange platformed scooters. The Coral research group at Carnegie Mellon University is preparing to hold the first ever football match in which mixed teams of humans and robots play against each other, all on Segways. The game, which kicks off in March, will be the first time robots and humans will have taken part in a task in which they are peers and on an equal "footing", says Professor Manuela Veloso, Coral group leader. During the match, robots and humans will play on the same side against another team, in a bid to understand how well they can work together. "This is really something new. It is not about commanding robots, as it usually is, so this is very interesting," Professor Veloso told BBC News Online. The robots are not quite to the standard of David Beckham yet. 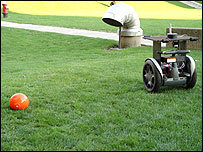 But they and the researchers are learning from their experiences of Aibo football. The Segways have been donated to the team by the manufacturers, and using Pentagon funds, they built the basic robot onto the cut-down scooters. Coral fitted out the robotic Segways with cameras which can locate brightly-coloured objects, and developed a kicking device controlled by an on-board computer. 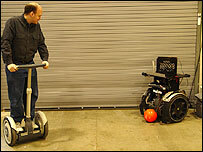 "The reason we used Segways is that they are very robust in terms of motion. Robots on wheels are very hard to make, going uphill can be difficult," said Professor Veloso. "The mechanical platform has a balance mode, so it makes it interesting to use as a motion platform." The robots have been programmed with a learning-based software, Mobile Autonomous Robot Software (Mars), which has been developed by the Pentagon's Defense Advanced Research Projects Agency (Darpa). Both humans and robots have the same acceleration, speed, turning capability and will use the same type of kicking device. "We constantly have Segways kicking balls everywhere. 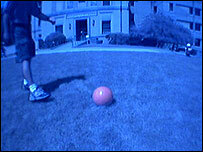 We have got to the stage where they can see the ball, follow it well, and it can kick it well. But it cannot aim very well yet," said the professor. "So now we want to more on the intelligence side and get the robot to think about where it can go and where it can kick it, on the strategic AI level." Robots and humans balancing on specially-adapted Segways sounds like a fun kick-around, but the research has some serious applications. Ultimately, the experiments could help scientists understand more about how AI robots and humans can work in teams, communicate and collaborate. The results could translate into being able to use robots and humans effectively in tasks that require them to work in teams, in search and rescue operations, as part of construction crews or in space exploration. "My research has all been about having the robots handle tasks in a teamwork scenario. Robot soccer has been an excuse for needing a team, and it is a challenge because of the presence of opponents," said Professor Veloso. "In a soccer match, you have to make a decision in real-time because the ball is coming in front of you and you have to pass." Having worked with robots all her professional life, she is passionate about them and committed to changing the prevailing perception that they are just programmable chunks of metal with chips for brains. Currently, robots are very often deployed as human replacements, doing jobs in environments which are unsuitable for people, in deep space or deep under the sea. "My passion," explained Professor Veloso, "is bringing robots into daily life, rather than sending them into space." "And maybe 10 years from now, we will understand more about how humans will relate to artificial life."